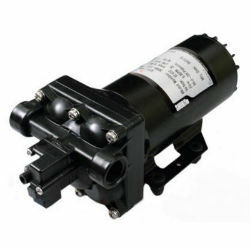 This pump is designed with Santoprene® Diaphragm for chemical resistance and maximum life, as well as Viton® Valves for maximum chemical resistance. The pump is available in the same footprint as other Shurflo® pumps, allowing users to upgrade to a higher performance on existing installations. Delivers 5.3 GPM (20.1 L/min) free flow. Field-proven pump head design. Driven by a 12-volt, continuous duty, sealed motor. Automatic demand with built-in pressure switch, set at 60 PSI. Self-priming capabilities, up to 8 feet (2.4 m).